This finely detailed souvenir building replica was produced in the late 1990’s and is not easy to come by. 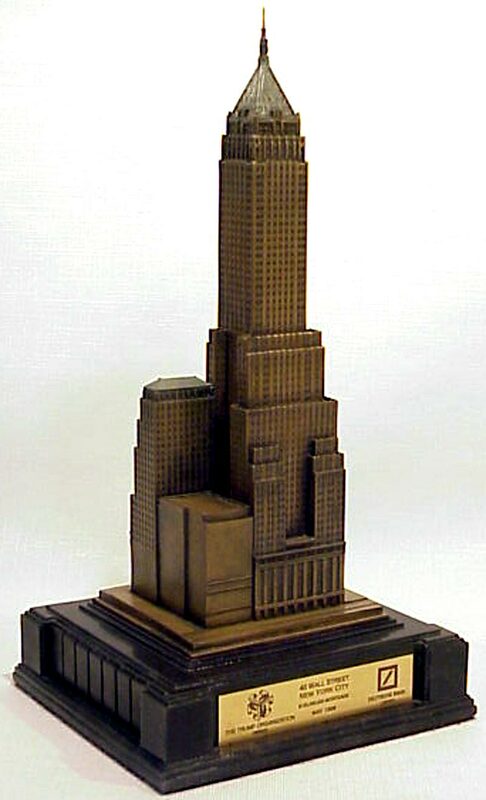 A plaque on the base reads: “40 wall street, New York City, $125,000,000 mortgage, The trump organization, May 1998, Deutsche bank owner lender.” There's a sticker on the bottom: “Made in USA Benchmark Models San Francisco.” This replica stands about 12 inches tall and is made of 'bonded bronze,' which is a mix of bronze with a resin binder. InFocusTech also makes a miniature souvenir replica version of 40 Wall Street. Originally named the Bank of Manhattan Trust Building, the real 40 Wall Street was remarkably completed in 11 months and opened in 1930. Designed by Architects H. Craig Severance and Yasuo Matsui. the 72-story, steel and limestone art deco structure is topped by a distinctive green pyramidal crown. The tower was once a part of a celebrated three-way race to become the tallest building in the world. The building briefly held the world’s tallest title until it was eclipsed by the Chrysler Building‘s spire. In 1996, Donald Trump renovated 40 Wall Street to its original grandeur with, “3,500 new Wausau windows, two 1,300-ton York Chillers, and an all new Italian marble and bronze lobby.” It has also been known as Manhattan Company Building, it was later known by its street address when its founding tenant merged to form the Chase Manhattan Bank and today is officially named the Trump Building. Trump planned to convert the upper half of it to residential space, leaving the bottom half as commercial space. However, the cost of converting it to residential space proved to be too high, and it remains 100% commercial space. Like the Empire State Building, the 40 Wall has also been hit by an aircraft: in 1946 a US Coast Guard plane hit the building in fog, killing four people. In 1998, the building was designated a landmark by the New York City Landmarks Preservation Commission. I created this model. Deutsche bank commissioned the model. Copies of the original blueprints from the 1930's were sent to me. I used the blueprints to redraw the entire building in AutoCad. The CAD files were used to create brass etched parts which were assembled together to form the building model. In addition to the building model I also created an art deco base for it. Deutsche Bank was so anxious about having the models completed on time, they called every morning at 6am to check on progress. 40 copies of the building were commissioned, one of which was to be given to Donald Trump. I created the original model. The mold and casting was done by another individual. Some of the cast models had minor flaws. These were given to me. I in turn gave them to my architect friends. Hello TheCeltadon, thanks for the great additional information! Hi Celadon, I'm interested in acquiring or borrowing this model for an exhibition. Any idea where I can get hold of one?